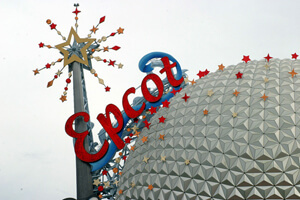 Today, Walt Disney World celebrates the 30th anniversary of the opening of Epcot, a site dear to countless drum corps fans who have fond memories of corps events in the park that were centered around the DCI World Championships at the Florida Citrus Bowl in Orlando (1996-1998, 2003). The first of four times the World Championships went to Orlando, DCI held a parade of all the corps through Epcot, ending at the America Gardens Theatre, where the Individual & Ensemble Showcase presented the winners in various categories from the competition earlier in the day. The parade and showcase attracted a standing-room-only audience and magnificently presented the best DCI corps had to offer. Always a highlight of a visit to Epcot for any drum corps fan, was running into one of Disney's performing ensembles called Future Corps. The group performed up to seven shows a day at the park and was comprised of just a handful of brass players and percussionists. You'd often see the snare player also on a cymbal and the bass drummer playing a contraption that stacked three drums vertically. And although there were just a few horn players, the sound was beyond spectacular. A 1984 Epcot promotional video featuring Future Corps. When the Drum Corps Midwest All-Stars passed through Orlando on the way to the Miami Orange Bowl Parade in December of 1988, while those of us on the trip were all presented with an all-day ticket to Epcot, many (if not most) of us didn't stray far from where Future Corps was performing. We caught all the shows the ensemble was performing that day which always included a bevy of high-energy jazz charts. Many of Future Corps' members were alums of DCI corps, and all did a great job of spreading the word about drum corps. Who doesn't love the theme from "The Jetsons"? This intro is stunning for its clarity. Every horn player has their chance to unleash in a solo capacity. A drum corps favorite that captures everything corps fans love! Hey, it's Malague?±a. Need more be said?